With limited space in my workshop ... uh, I mean, gargage ... I have to be able to easily move tools into use and back into storage. 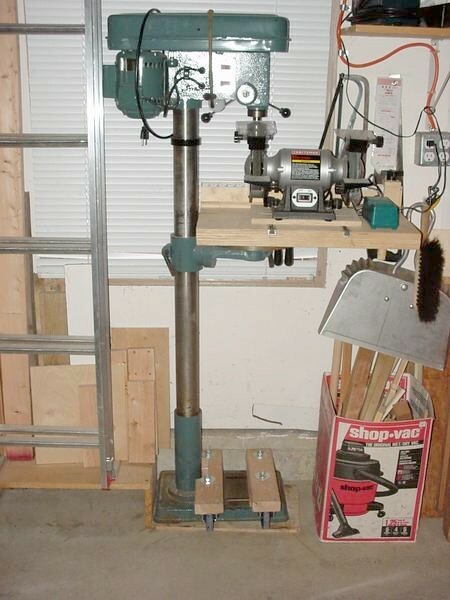 I've been meaning to make a mobile base for my drill press for this very reason. I started out to build the usual platform style base but it ended up being a kind of ugly contraption. 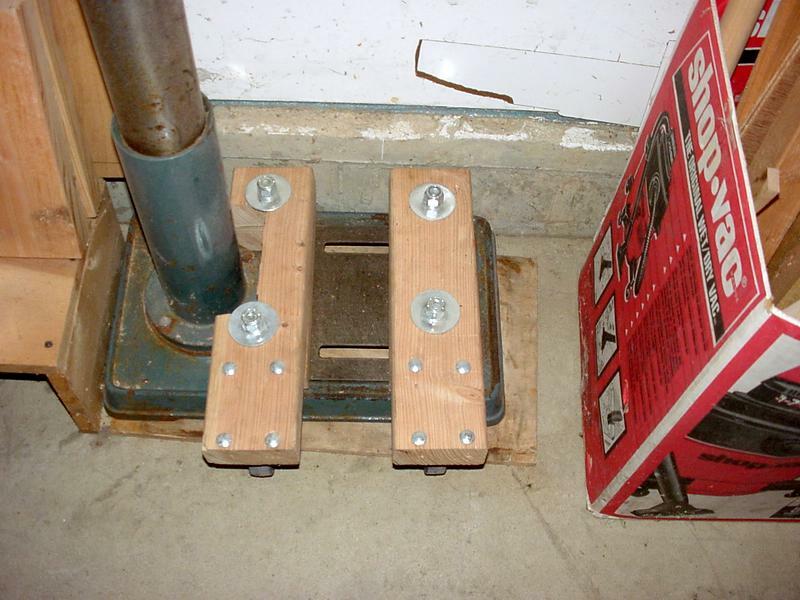 As I stared at the press, I realized that the base was already pre-drilled and would accomodate a more more "minimalist" approach to solving the problem. You see the results here. Note that the piece of wood under the base has nothing to do with all this. (It's just there to keep the base off the floor during storage to minimize moisture and rust.) 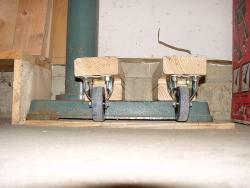 The wheel mounts are sized so that the wheels do not touch when the base is in direct contact with the floor. 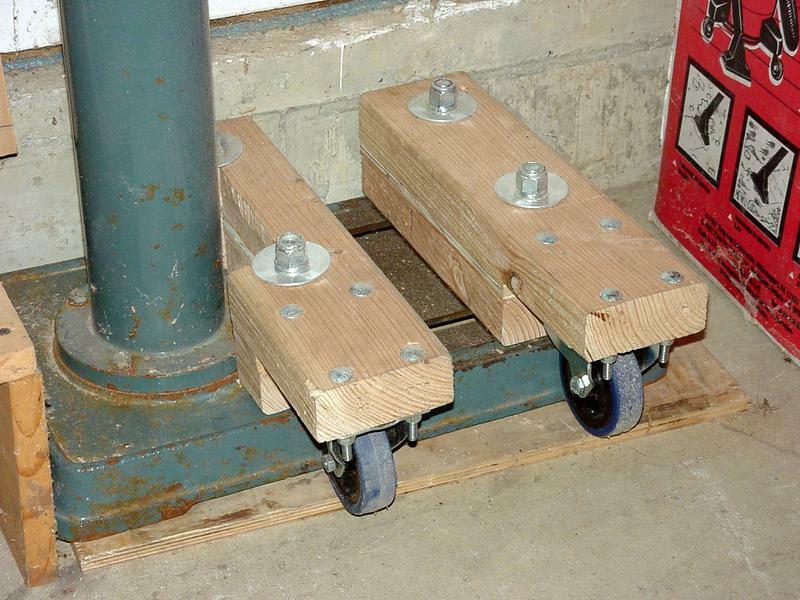 When I want to move the press, I just stand to the left of it, tilt it towards me until the wheels touch the floor and roll it into place. 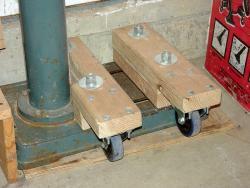 I got the wheels for about $5 each at the local Harbor Freight store. Total project cost with lumber and mounting hardware was thus about $15. In other words, "minimalist" ended up being Short, Sweet, Simple, and Cheap. 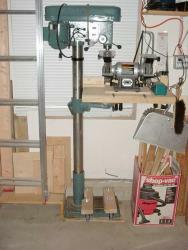 WARNING: A drill press is a very top heavy item. This approach to wheeling it around has the problem that the press can get away from you when you tilt it to move it around. This can cause you to hurt your back, neck, feet and so on. YOU HAVE BEEN WARNED!